Golf Rules Q&A: Standing on Your Putting Line? Along the banks of the Yadkin River in Clemmons, NC lies an oasis for golf. It is Salem Glen Golf and Country Club, awarded four stars by Golf Digest's Best Places to Play 2006/2007. As the Triad area's One and Only Nicklaus Design course, Salem Glen continues the legendary Nicklaus tradition of accentuating the natural terrain. Salem Glen takes full advantage of the 150 feet of elevation changes, four and a half miles of creeks and nine lakes. The excellence of Salem Glen is evident as it features Bermuda fairways and G2 bent grass greens, the same as those found on the legendary Pinehurst No. 2. 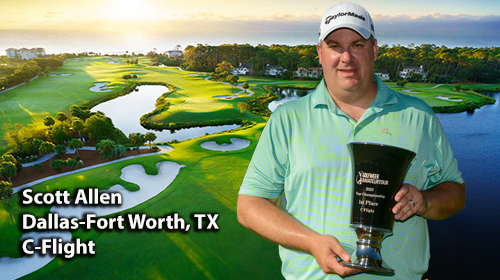 Tour players players will find risks and rewards options as Salem Glen will challenge your course management skills. Plus, Salem Glen plays almost as if it were two courses. The front nine is a links-style layout. The fairways are open and flat, and there's several water hazards coming into play. Five holes of the front nine are set in the Yadkin River basin. The back nine holes are mountain-style with dramatic elevation changes. Most of the fairways are tree lined. From the tee box, No. 13 is a breathtaking par 4 where your tee shot must carry a 70-foot deep ravine. Fourteen is a par 5 playing back over the ravine to a long, shallow green cut into the hillside. The four closing holes are the toughest on the course, from No. 17, a par 3 flanked by creeks in front and behind the large green and No 18, a par 4 where tour members may bail out right hoping to bounce their ball close to the green or carry the bunkers fronting the sloping green. A great course to play after the last major and returning from the one week break. Spots are available, so we hope you sign-up to play. Expect your peers to have already signed-up. Call Bruce Hallenbeck at 336-495-6556 or email him at behgolf@aol.com. 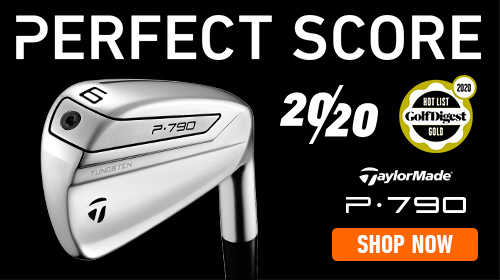 RockBottom Golf Provides Discounts On Brand Name Golf Gear from Clubs to Apparel to Accessories at the Lowest Prices on the Web! Click Banner Below To See the Latest Products and Prices. 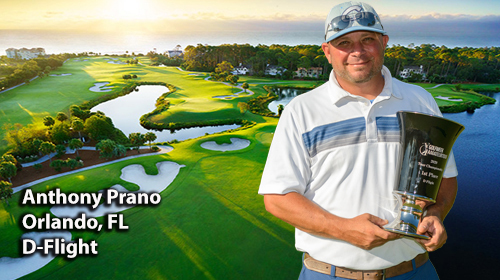 High Point's Dan Holland overcame a bad shoulder to take home 1st place in the Championship Flight of the Golfweek Amateur Golf Tour's final Major Championship of the 2013 season at Anderson Creek Golf Club. "I haven't been able to play lately because of this bad shoulder", said Holland just prior to the start of the event. "I'll give it my best shot". His best shot proved good enough as his 75 was 1 stroke better than runner-up Ron Hockensmith of Whispering Pines. Every player in the field enjoyed mild temperatures and sunshine, a far cry from the last 2 Tour events which were contested in rainy, humid conditions. The overall scores which were significantly lower than the previous 2 weeks, reflected the perfect weather conditions. Nowhere was this more evident than in the B Flight, where Lewisville's Scotty Lewis equaled Holland's low round of the day for a 5 shot win over Greensboro's AJ Haardt. 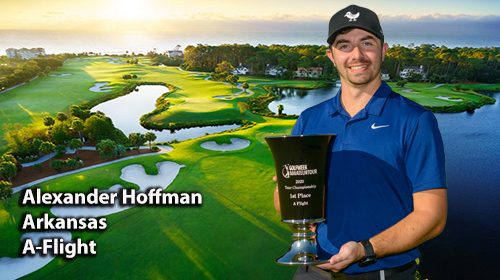 "Scotty has shown great improvement since the beginning of this year", said Tour Director Bruce Hallenbeck. "I'm very pleased with his progress. He'll be competing in the A Flight for future events". 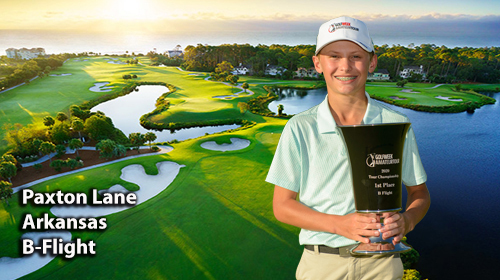 When he gets there, he'll be facing some strong Fayetteville-area Tour members: Godwin's Jay Yergeau and Ryan Hair of Hope Mills. Yergeau's 77 was the class of the flight, with Hair only a single stroke behind. Hair's tap-in birdie on the difficult par-4, 16th hole today keyed his round. In C Flight action, Anderson Creek member George Walkden used some 'home-cooking' to coast to a 4-shot win over James Eatmon of Sims, 84 to 88. They were the only 2 flight members to break 90. In the D Flight, another course member also emerged victorious with an even 100 as Nathan Phillips edged Greensboro's Keith Thomas by a single stroke. 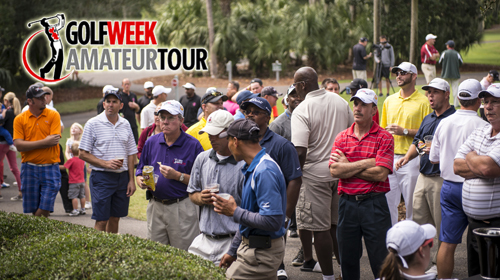 The Golfweek Tour will be taking next week off so Tour members can spend the Labor Day holidays with their families. 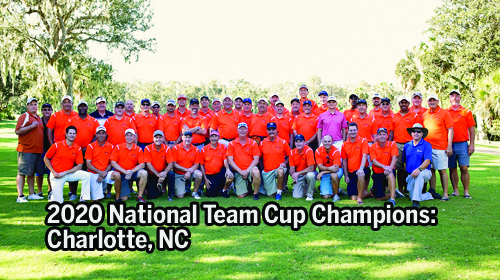 Tour play will resume on September 7 at Salem Glen Country Club, just outside of Winston-Salem. There are spots available for this event. A. I am making a chip from off the green, I can position anyone on my line of play beyond the hole when making the stroke. B. I am putting from on the green. While I make the stroke, I can have someone point out the line of putt provided they do not touch the surface of the green. C. I have a tight shot through the trees. My partner’s caddie may stand behind me on an extension of my intended line through the trees while I attempt the shot. D. Only in foursomes play, where we are playing one ball (in alternate shot format), may I allow my partner to watch me putt from behind on an extension of my line. A. False. R8-2a. When not on the green, the player must not position anyone on or close to the line of play, or an extension of the line of play beyond the hole while the stroke is being made. B. False. R8-2b. When the player’s ball is on the putting green, the player’s partner or either of their caddies may, before but not during a stroke, point out a line for putting, but must not touch the green when doing so. NOTE: When the player’s ball is off the green, there is no prohibition against touching the putting green when pointing out the line of play. R8-2a. C. False. R14-2b. The player must not make a stroke with his caddie, his partner, or his partner’s caddie on or close to an extension of the line of play or line of putt behind the ball. NOTE: Definitions of both Line of Play and Line of Putt includes a “reasonable distance either side of the line”. D. False. R14-2b, R29. There is no exception in fourball or foursomes play to R14-2b. The common theme here is “when a stroke is being made”. You can pretty much place people where ever you want, except during the stroke. The most common breach is by partners who have similar lines of putts. The partner who is to putt second wants to watch his partner’s putt from behind to get a read. He can’t stand behind. He must be off to the side, till the ball is on the way, then may quickly step in to view the ball as it rolls. Alternately, if his partner is putting from on the green, there is no restriction that prohibits a partner from standing beyond the hole to watch the stroke. That restriction only applies to a ball off the green. Also, review the note in item C above. When positioning yourself to be able to move in after a stroke is on the way, you must be a minimum of a reasonable distance either side of the extension of the line. On the putting green that is a minimum of one club-length to the side. The above penalties are always on the player who is making the stroke. So if it is your stroke, you are the one who has to get the partner or caddie to move. In stroke play, you pick up two strokes. In match play, you lose the hole or in fourball, disqualified for the hole. In fourball play if the breach would also assist your partner in his play of the hole, you are both penalized. Even in casual play, avoid doing this as it is a bad habit to get into. RELUCTANT OPINION : Since the Rules of Golf does not recognize a “Scramble” format as a legitimate form of play, these restrictions probably don’t matter much for that or other similar “hit and giggle” formats. LifeLock provides identity theft service, specializing in the prevention of identity theft rather than the reporting of it. LifeLock was founded in 2005 and is already considered the industry leader.